Today we hear James warn against selfish ambition, while the disciples quarrel over which one of them is the greatest. Jesus tells them the way to be great is to serve. Then, to make it concrete, he puts in front of them an actual flesh-and-blood child. We are called to welcome the particular children God puts in front of us, to make room for them in daily interaction, and to give them a place of honor in the assembly. Next Sunday: We will reflect on Bishop Bartholomew’s sermon on “Being Neighbor” and explore together the challenges and joys of deepening our relationships with the neighbors around St. Mark’s. At 12:30, we will walk to the Tenderloin Neighborhood with former San Francisco Night Minister, Rev. Chuck Lewis and visit the Tenderloin Museum at 398 Eddy in order to learn more about the history and life of this neighborhood. There is a small entrance fee to the museum and an option to take a “walking tour” of the Tenderloin at 2:00 that day with one of the museum’s docents. The St. Mark’s community is invited to celebrate the life and faith of long-time member Sig Sigafoos at a Memorial Service held at St. Mark’s. There will be a reception in Heritage Hall following the service. Information Gatherings for New Journeys in Faith Group: October 14 and November 18. 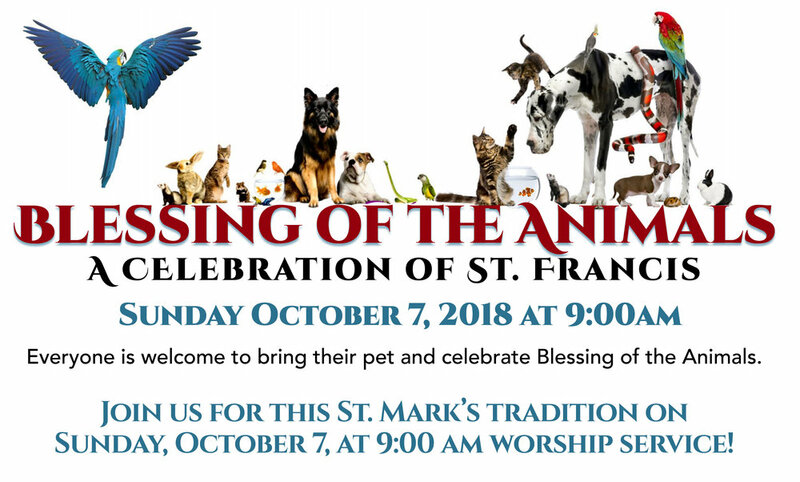 New to St Mark’s? Thinking about your faith journey and a community to support it? What does it mean to be a member of a church? How do you become a member of St Mark’s? FOR SUCH A TIME AS THIS! A CALL TO ADVOCACY! Are you frustrated by current policies of our government that seem inconsistent with your Christian faith? Come to this workshop and learn how to be an effective advocate for change! chancel on a Sunday by placing your name on the chart for the Sunday you wish. Your donation can be in memory of a loved one or in honor of a particular occasion. Please go to http://www.stmarks-sf.org/flower-donations/ to sign up on our online chart. If you are unable to sign up online please call the office (415-928-7770). Nestled in the beautiful Santa Cruz mountains, Mt. Cross Lutheran Camp has nourished the faith of thousands of young people and children through camping ministries. Mt. Cross is now celebrating it’s 70th Anniversary and invites you to their celebration events on-site at the camp. On Sept. 28, you are invited to an evening of delicious food and a program about future Mt. Cross ministries. On Sept. 29, families are encouraged to attend the camp and enjoy a BBQ and camp activities. To RSVP and find out more, go online: www.mtcross.org or call 831 336-5179 The camp is located at 7955 Route 9 in Ben Lomond. All are welcome. CONSIDER SHARING YOUR OPINION WITH THE SANCTUARY TASK FORCE. St. Mark’s Sanctuary Task Force has been asked by Church Council to consider whether St. Mark’s will declare itself a Sanctuary congregation. The Task Force is working with Interfaith Movement for Human Integrity www.im4hi.org to learn about Sanctuary. We would like to hear from St. Mark’s congregation members about this possibility. Please consider scheduling a 20-30-minute conversation with a Task Force member in the next few weeks. The interviews can be on the telephone or in-person or in writing – it would be your choice. Prior to the conversation, it would be helpful if you read and prayerfully considered a one-page description of the 21st century Sanctuary congregation. We can give you the document to read. If you are interested in sharing your opinion, please email Mary Ritter mlrpeds@aol.com or call 510-895-0336 to get a copy of the one page Sanctuary description and schedule a time to talk with one of the Task Force members. Thanks in advance for considering this.